Spain is a fantastic place to visit. Delicious food, fantastic wine, and beautiful coastlines are just a few of the attractions the country has to offer, and in general it is quite affordable. 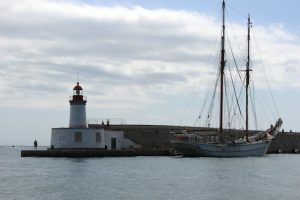 In particular, from the Straight of Gibraltar to the Costa Brava there are countless coastal towns that have plenty to offer. When you get to Spain, you should waste no time getting to the infamous Jamón. If you can afford it, the best you can find is Jamón Iberico de Belota. This is a product from a highly controlled region, where the pigs are raised eating only acorns, and only the finest acorn at that. It is available all throughout the country, but can even be found quite plentifully in the airport. 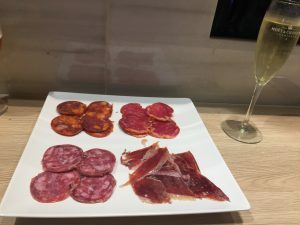 If your trip to Spain consists of nothing more than a layover in Madrid or Barcelona international airports, you’d be foolish to pass up on the opportunity. With no preservatives other than the salt used to cure, the finest of this dark meat will melt in your mouth. It certainly pairs well with a glass of cava, or a staple beer such as Estrella – if, of course, this is up your alley. There are many towns along the coast worth seeing. The major places of interest are Seville, Valencia, and Barcelona, each offering a unique subculture. 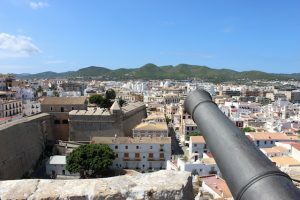 There are also smaller sea towns interspersed between these major cities, such as Cordoba, Javea, and Alicante, or the island destinations such as Ibiza, Formentura, and Palma. It is hard to go wrong with any of these options. The island of Ibiza in particular, while prominently known for parties and late night DJ concerts in the numerous nightclubs, is also a wonderful place for swimming, relaxing, and enjoying life. In Ibiza Puebla, the downtown area, there is a marvelous castle and medieval area. If you are indeed in search of eternal nightlife, the place to be is Playa d’en Bossa, which is like Las Vegas for nightclubs, without any rules (and there are very few rules in Las Vegas, if this helps to put the scene in perspective. Between these two towns is the beautiful town of Figueridos. Here you will find nice sand beaches, beautifully calm and warm seas, and if you look in the right places you will also find some excellent food. Worth noting is the French restaurant Soleada, which offers not only a gorgeous view of the sea, but also some of the best cuisine on the island. If you are in the are you will not want to miss it, but make sure to secure a reservation if you are going during the busy times as it can be quite popular. If you are seeking a taste of Spanish culture, but you also want to relax and enjoy beaches in style then the Spanish Mediterranean coast is an excellent choice. With a wide variety of options you really cannot go wrong. Start making plans for your next vacation today! My name is Jeremy. When I’m not working, I’m making every effort to see new and exciting parts of the world. Read more. Looking for an Adrenaline Boost? Try Paintball!